Vivid-Pix Picture-Fix Software provides automatic corrections to underwater photographs. The common color balance, contrast, and brightness issues are taken care of with a single click with the option of the best version via the 9-up selection window. After this adjustment is applied you can then use sliders to fine tune the image to your liking. 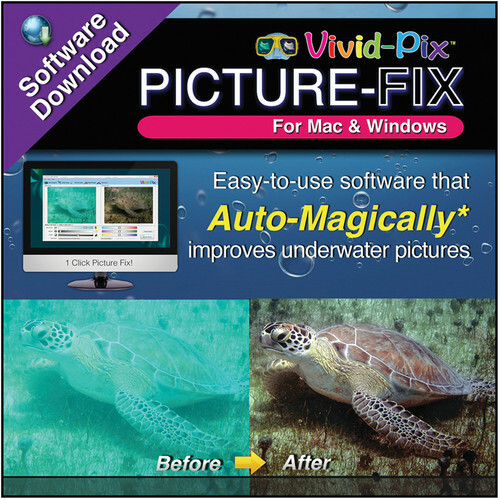 This software can also provide 1-click image editing to photographs taken above water. This improves the brightness, contrast, and sharpness of the image. You can then quickly save any file and share them with friends and family. This includes a card with information for downloading the software from the Vivid-Pix website. There are versions available for computers running either Mac OS X 10.6 or later or running Windows XP or later. With a single click, automatic adjustments and corrections can be applied to your images. This results in speedy, yet beautiful images for you to share with others. Programming and algorithms designed for underwater photographs ensure high-quality corrections will be made. Also, it is compatible with images taken above water, where the software will provide similar enhancements. When a file is imported a selection of 9 varying brightness and contrast adjustments becomes available. From here you select the best image and fine tune it from there. The variance between the images can even be adjusted in the settings to give either a wide or narrow selection. A selection of sliders can be used to fine tune color and other settings once the image is imported into the software. This includes brightness, contrast, and specific color adjustments. Also, the Windows version includes vividness, sharpness, and cropping options as well. Box Dimensions (LxWxH) 9.0 x 6.0 x 0.3"
Does vivid pix work with raw files? No it does not support RAW yet. They claim to be working on adding it to newer versions.